We’re developing a tool letting people work out if they can get legal aid (help paying for legal advice) which we've just tested with users. The tool, called Can you get legal aid?, asks questions about their type of problem and finances, and is similar to ‘smart answers’ on GOV.UK, like our guide to inheritance rules. Our developers built the tool in-house, drawing on GDS open source code and design principles. We’ve used an agile approach, starting with a simple early prototype to test with users. 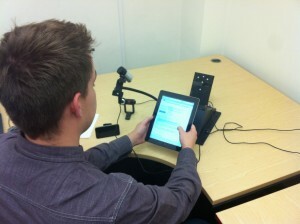 Digital consultancy Reading Room carried out the user testing with 12 people in London and Manchester in December. Users were given scenarios in which they might need legal aid, and asked to think of their own, to see if they could use the tool to get help. The feedback was overwhelmingly positive, and 81% of users successfully completed the tasks. One user said they were impressed as they “didn’t know it was so simple”. They liked the mobile version as much as, if not more than, the desktop one – important given more and more of us have smartphones. We also received plenty of suggestions for improvements. Some users were confused by some of the language – words like ‘mediation’, ‘discrimination’ or ‘debt’. Most of the text is plain English, but we need to do more to explain some unclear terms. 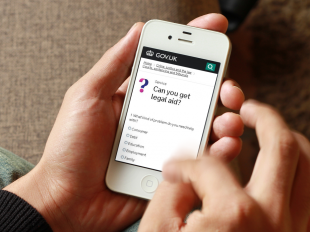 Many users also wanted more information about why they weren’t entitled to legal aid. We made several small improvements to the tool in the few days between the user testing sessions, which solved some of these problems, and made a significant difference to the results. The user testing indicates that the public will find the tool helpful, and has been invaluable in pointing out problems ahead of launch. We’ll be refining the tool, getting more feedback from end users and will go live with it in time for legal aid reforms in April. I do mental health law and tested this - there is no category other than 'none of the above' selected that and asked to put in postcode. I put in the full post code of our firm i.e. E1 4TP and got Duncan Lewis (not in E1), worst of all the only other 3 firms that came up were Hammersmith and Fulham Law Centre in west London, North Kensington law centre in west london and Alan Edwards sols in west london overe 10 miles away NONE of them do mental health. There is something seriously wrong with your databse on firms which needs sorting out. There are a number of firms apart from ours who do mental health in E1. Hi Carolyn, Apologies - the postcode search isn't functional yet, as this is a very early 'alpha' prototype of the tool, which we produced to test the questions and answers with users. Rest assured that when the final product goes live in April we'll be linking to the legal adviser finder dataset, which will produce valid results. We'll also be making lots of other changes in response to feedback from the testing.